In our conversations with Windows users, we’ve noticed an interesting trend that has become more prominent in recent years: people don’t delete files as often as they used to. We’re sure that the reason for this is the absolutely huge hard disks that are offered these days. Even entry-level systems come equipped with 250GB or 500GB disks, and terabyte-sized drives are no longer a big deal. Unless someone’s working with digital video files, even a power user isn’t going to put a dent in these massive disks any time soon. So, why bother deleting anything? Although it’s always a good idea to remove files and folders you don’t need (it makes your system easier to navigate, it speeds up defragmenting, and so on), avoiding deletions does have one advantage: you can never delete something important by accident. Just in case you do, however, Windows 8’s Recycle Bin can bail you out. The Recycle Bin icon on the Windows 8 desktop is actually a frontend for a collection of hidden folders named Recycled that exist on each hard disk volume. The idea is that when you delete a file or folder, Windows 8 doesn’t actually remove the object from your system. Instead, the object moves to the Recycled folder on the same drive. If you delete an object by accident, you can go to the Recycle Bin and return the object to its original spot. Note, however, that the Recycle Bin can hold only so much data. When it gets full, it permanently deletes its oldest objects to make room for newer ones. If you’re absolutely sure you don’t need an object, you can permanently delete it from your system (that is, bypass the Recycle Bin) by selecting it and pressing Shift+Delete. • You delete the object from a removable drive. • You delete the object from the command line. • You delete the object from a network drive. The Recycle Bin has a few properties you can set to control how it works. To view these properties, right-click the desktop’s Recycle Bin icon and then click Properties. Windows 8 displays the Properties dialog box sheet shown in Figure 1. Figure 1. Use this property sheet to configure the Recycle Bin to your liking. 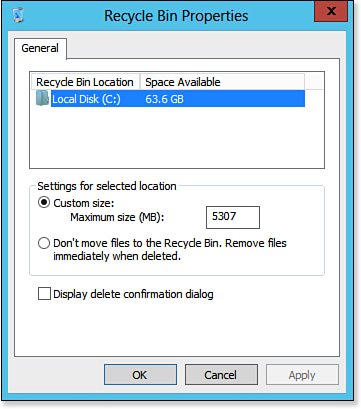 • Recycle Bin Location—Choose the Recycle Bin you want to configure: you see an icon for each of the hard drive partitions on your computer. • Custom Size—Enter the size of the Recycle Bin. The larger the size, the more disk space the Recycle Bin takes up, but the more files it will save. • Do Not Move Files to the Recycle Bin—If you activate this option, all deletions are permanent. • Display Delete Confirmation Dialog—For the first time in Windows history, Windows 8 does not ask for confirmation when you delete an object. If you miss the prompt, or if you just want to be super careful about deletions, activate this check box. You can clean out your Recycle Bin at any time by right-clicking the desktop’s Recycle Bin icon and then clicking Empty Recycle Bin. The Recycle Bin contents can also be purged using Windows 8’s Disk Cleanup utility. Click OK to put the new settings into effect. 1. Open the desktop’s Recycle Bin icon, or open any Recycled folder in File Explorer. 2. Select the object you want to restore. If deleting the file or folder was the last action you performed in File Explorer, you can recover the object by selecting the Edit, Undo Delete command (or by pressing Ctrl+Z). Note, too, that Windows 8 enables you to undo the ten most recent actions.